After the worst start to the year in its history, the U.S. stock market closed 2016 on a strong note, recording its best year since 2013. By the time the final closing bell rung on Dec. 30, the Dow Jones had gained 13.42%, the S&P 500 jumped 9.54% and the small cap Russell 2000 had rocketed an impressive 19.48%. This strong performance contrasted sharply with the performance of global stock markets, which yet again struggled to keep up with their U.S. rival. Every time-tested asset allocation strategy on the planet recommends that you diversify your stock investments by investing in global stock markets. Yet, the advice to invest internationally over the past decade has been a real dud. After the financial crisis of 2008, emerging markets tumbled far more than the U.S. markets. What’s worse is that these markets never really regained their mojo. MSCI Emerging Markets Index ETF (EEM) versus the S&P 500 over 10 years (excluding dividends). Over the past decade, the MSCI Emerging Markets Index ETF (EEM), the best known proxy for the entire sector, generated average returns of only 1.09% per year. That performance trailed 10-year average return of the S&P 500 Index ETF (SPY) of 6.87% by a whopping 5.78% per year. The outperformance of the U.S. stock market compared to its global rivals over the past decade has been astonishing. I track the performance of 47 global stock markets through country-based exchange-traded funds on a daily basis. 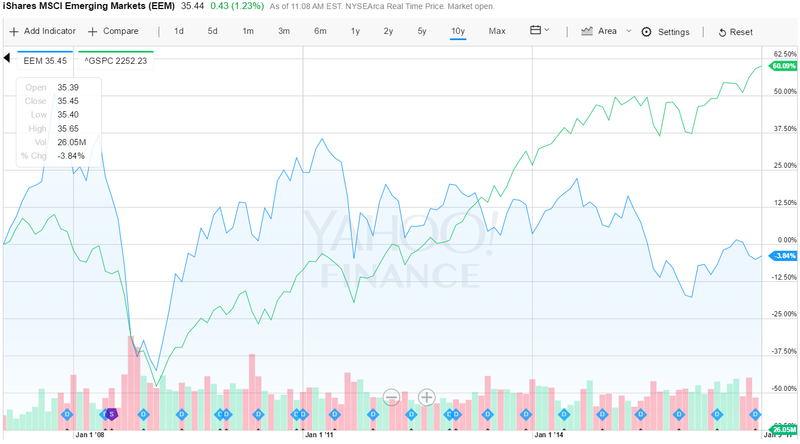 For the United States, I look at the Vanguard Total Stock Market ETF (VTI). That’s because it includes small- and mid-cap stocks, providing a more complete view of the U.S market than, say, the S&P 500. Among these 47 global stock markets, VTI ranked No. 1 over 10 years, No. 2 over 5 years, (behind Ireland), and No. 1 over three years. Put in Olympic terms, that’s two gold medals and one silver medal over the past decade. Sure, a handful of global stock markets boast standout returns each year. And 2016 was no different. After a long-suffering half a decade of underperformance, the iShares MSCI Brazil ETF (EWZ) soared 64.47%. Bad boy Van Eck Vectors Russia ETF (RSX) was third with a return of 47.01%, despite a stock market leveraged to the price of oil. Still, only 15 stock markets out of 47 eked out double-digit-percentage gains in 2016. And no global stock market has outperformed the United States in the past 10 years with any consistency. Few things are predictable in investing. That’s a fancy way of saying that when the price of anything gets too far out of whack in any direction, it’s only a matter of time before it snaps back in line with its long-time average. Put in financial market terms, cheap stocks will get more expensive and expensive stocks will get cheaper. Based on that insight alone, global stock markets are due for a sustained period of outperformance compared to U.S. stocks. Then there is also the knotty issue of valuation. The Shiller–CAPE Index is defined as price divided by the average of 10 years of earnings (moving average), adjusted for inflation. Think of it as a long-term average price-to-earnings (P/E) ratio. Academic studies have confirmed that the Shiller-CAPE Index is a reliable indicator for future real stock market returns not only in the United States, but also in developed global and emerging markets. Today, the U.S. stock market trades at a Shiller-CAPE index P/E of 27.9. That’s an eye-popping 67% above its historical average. In contrast, the Shiller-CAPE Index is 20.9 for developed global markets. It stands at a mere 14.4 for emerging markets. There are signs that the tide already may have started to turn for global stocks. While the MSCI Emerging Markets Index (EEM) gained only 10.87% in 2016, the Cambria Global Value ETF (GVAL) — which invests in the world’s cheapest global stock markets, as measured by the Shiller-CAPE Index, generated a more impressive 17.24%. And that was against the headwind of a strong U.S. dollar, which lopped a couple percentage points off GVAL’s dollar-based gains. That means that the performance of cheap global stocks in 2016 roughly matched the performance of red-hot U.S. small-cap stocks. So will 2017 mark the year that global stocks finally begin to topple the U.S. stock market from its Olympian heights? But when global stocks do recover, the reasons will seem obvious. P.S. Just as global markets may be poised for a run higher in 2017, one of my best picks of 2016 could be looking do even better this year. To learn about this winning stock, click here. In case you missed it, I encourage you to read my e-letter column from last week about counter-intuitive lessons that could be critical to your investment success.